Why Choose Millennium Printing for your yard signs? LOWEST prices! Really, Request a Quote and you’ll see for yourself! Highest Quality Inks, Sign Material & Galvanized H-stakes! Flexible Sizes For Your Custom Yard Sign Requests! FREE Shipping or local pickup! Rochester NY Yard Signs of All Kinds! A key service that sets us apart from other Rochester, NY sign shops is we offer free, custom creative design and layout service, not a cookie-cutter online yard sign store with the same old stale stock templates to pick from. We offer custom-designed yard signs in a variety of sizes, colors and designs, depending on your needs and requirements. Our goal is to make your signs “POP” and we tailor your yard sign design to match your existing branding and marketing scheme you use elsewhere. Our yard signs are quality made using a durable, white coroplast sign material (4mm corrugated plastic) with either 1-color or 2-color screen printed UV-resistant ink or full process color digital printed using UV-resistant ink. Meant for outdoor or indoor use, our yard signs are much more durable than paper or plastic bag signs, and are a very affordable way to promote your message. Our yard signs always include galvanized “H” stakes, which are durable, and can withstand the elements. 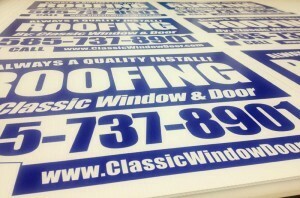 We offer local pickup for yard signs as well as free, convenient delivery to our Rochester, NY customers. For those customers outside our local area, we also ship direct to you for free! No other sign shop will offer you free shipping on yard signs.